question asked: Jul 30 '13, 8:45 a.m.
last updated: Aug 12 '13, 11:06 a.m.
"Rational Jazz Foundation - Foundation User" CAL.license is Expired. Would changes on LDAP display name have any impact on the Jazz tools ? Simon Eickel (1.1k●6●51●56) | asked Jul 30 '13, 8:45 a.m. I'm facing the error, that the synchronizer fails because there is some kind of login case sensitivity. Is there any possibility to prevent the synchronizer to fail? Or ... other question ... is there any possibility to get this matched? When I log into jazz.net he takes a special case, e.g. upper case, even when typing the username in lower case. Piotr Aniola (3.6k●15●34) | answered Jul 30 '13, 9:20 a.m. In Jazz, on the advanced properties page, you have the UseCaseSensitiveUsernameMatching property. This needs to match the case sensitivity setting of your LDAP (or whatever you use). It seems that you are using case insensitive matching, and the user is stored in LDAP as uppercase, hence, this is what is sent to the synchronizer. 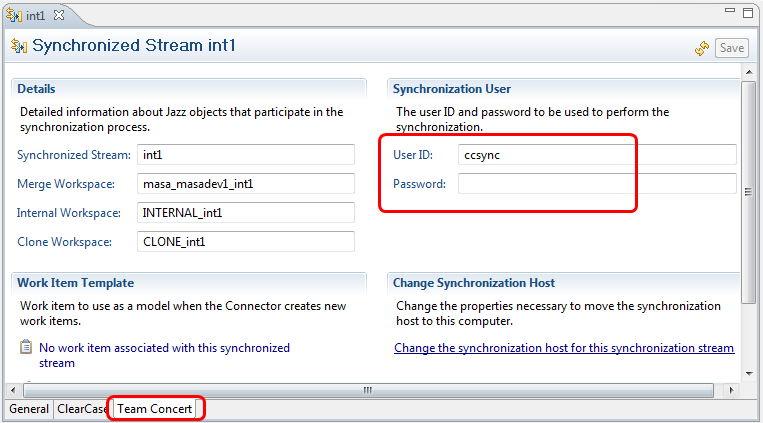 The case in which you type the username when logging in is not relevant, as the username is not forwarded directly from your login form to the synchronizer. Abraham Sweiss commented Jul 30 '13, 9:56 a.m. | edited Aug 01 '13, 8:55 p.m. When modifying the case sensativity in CLM, I believe this will need to be done for each application. and there is one gotcha: If case sensativity is set to be enabled from disabled, then there is the risk of creating duplicate users in CLM. If this occurs, these duplicate users will need to be manually changed and archived. Simon Eickel commented Jul 31 '13, 1:05 a.m. The problem is not that I have to connect to the Jazz repository in this case the user is synchronized from AD. I think the problem is that when I connect to the Jazz repository the connection will be established in either case. BUT the connected string looks similar to the kind the user is created in AD. Masabumi koinuma (461●1●5) | answered Jul 30 '13, 10:20 a.m.
Simon Eickel commented Jul 31 '13, 3:41 a.m. The user id is always written in upper letters even when connecting using lower laters. Even when changing the "ClearCase Login Name" of the ClearCase Provider Properties it doesn't change the "ClearCase User ID" of the Details screen (first snipped). Changing the "Sync User ID" to upper case fixes the problem - sometimes. My opinion is that this should work anyway as the case sensitivity should do nothing if the synchronizer whould match it correctly. Masabumi koinuma commented Jul 31 '13, 12:42 p.m.
Oh, apologies I wasn't clear enough. I meant to change the synchronization user ID on the Team Concert tab of the Synchronized Stream editor. You probably have already changed it from the Properties panel, anyway. Simon Eickel commented Aug 01 '13, 1:22 a.m. | edited Aug 01 '13, 8:56 p.m. I think for this there is no solution at the moment, am I right? 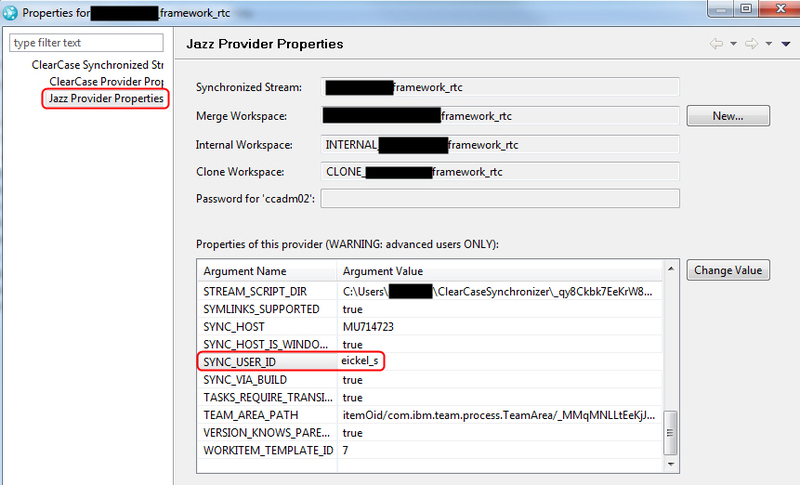 In such a case I have opened an Enhancement Request on Jazz.net (CC RTC Synchronizer should allow case insensitivity) to support the structure that the RTC synchronization ID and the ClearCase usrt ID are not in the same notation.